The endoscopic approach to the facet joints is a true minimally invasive method. The endoscope provides bright and sharp Images so that the doctor can gain an overview and treat the cause of the pain directly. Since the camera of the endoscope provides such good pictures, radiation exposure from imaging techniques like X-ray or computed tomography (CT) scan can be reduced. 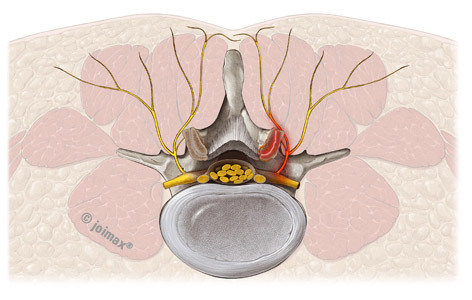 Using the joimax® technique, the doctor can resect the nerve fibres transmitting the pain directly at the origin of the pain. As a result of this precise endoscopic procedure, most patients feel a significant relief of symptoms or are free of pain right after surgery. If necessary, this endoscopic procedure can be repeated easily.